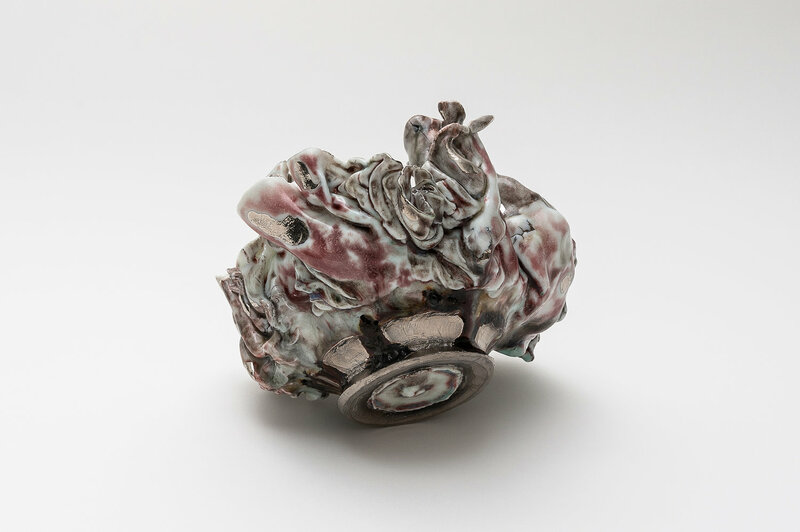 Nonaka-Hill is pleased to present a solo exhibition of Japanese artist Kentaro Kawabata. 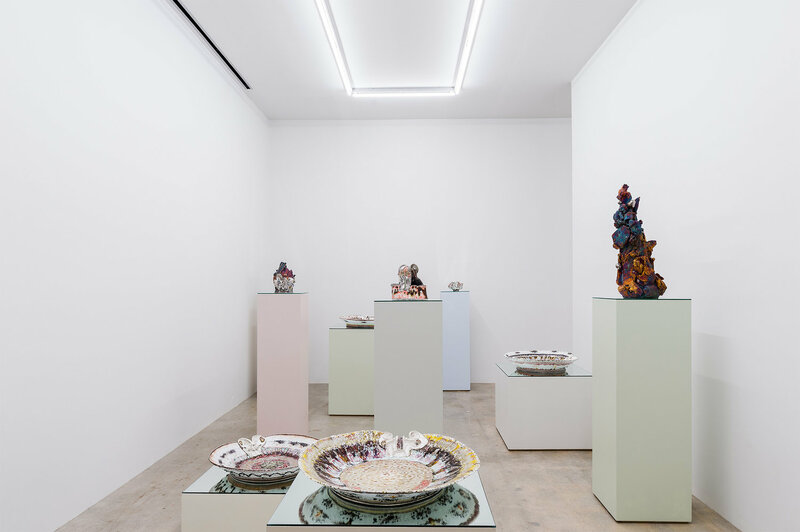 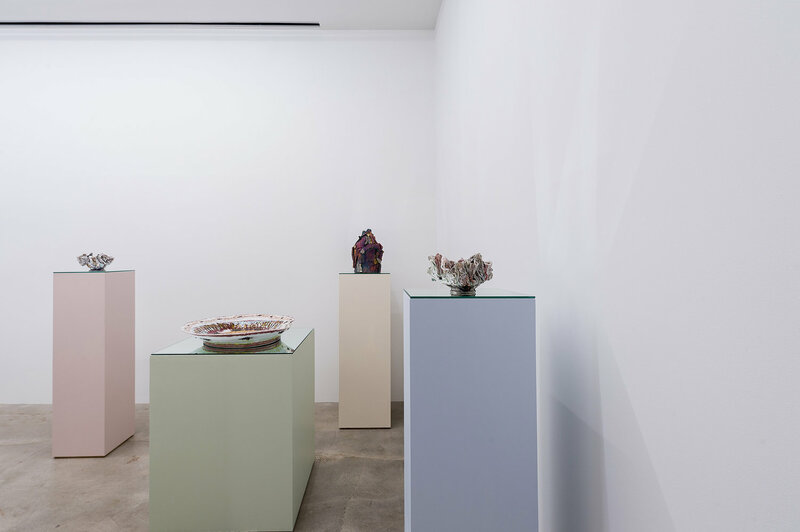 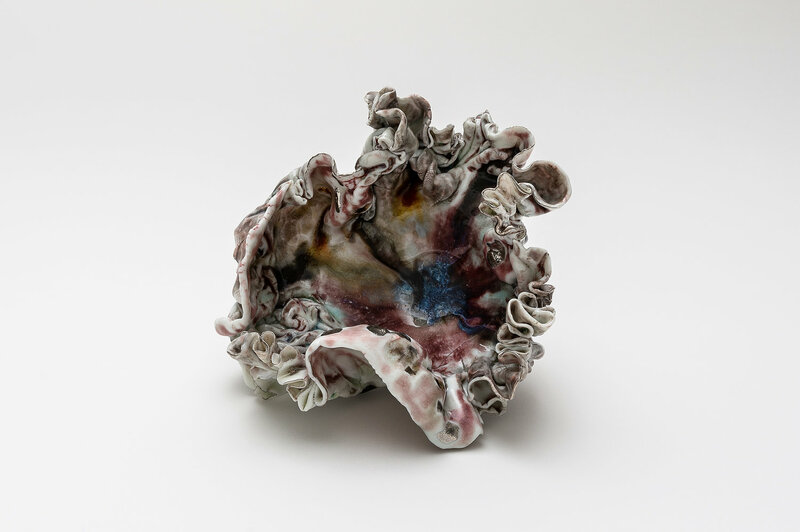 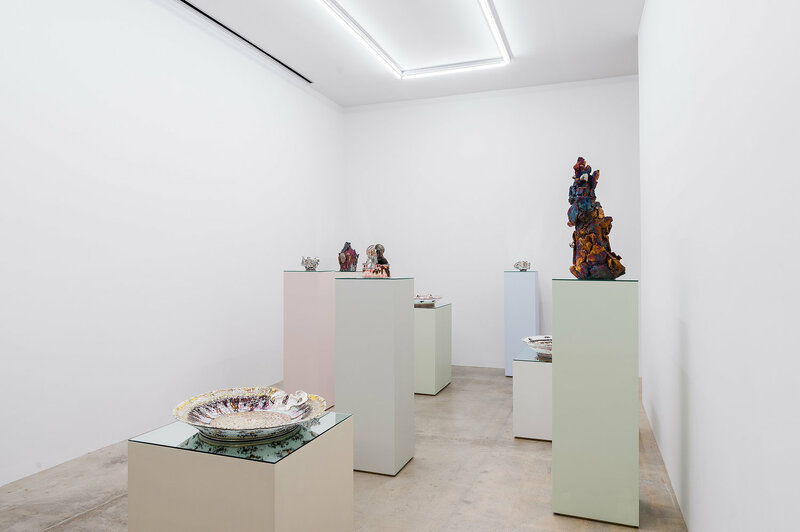 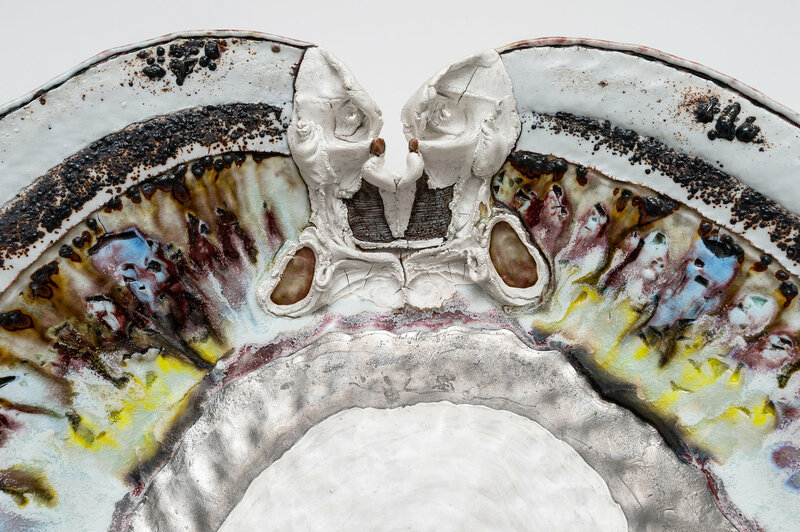 The exhibition of thirteen works, all produced in porcelain, are from four ongoing series. 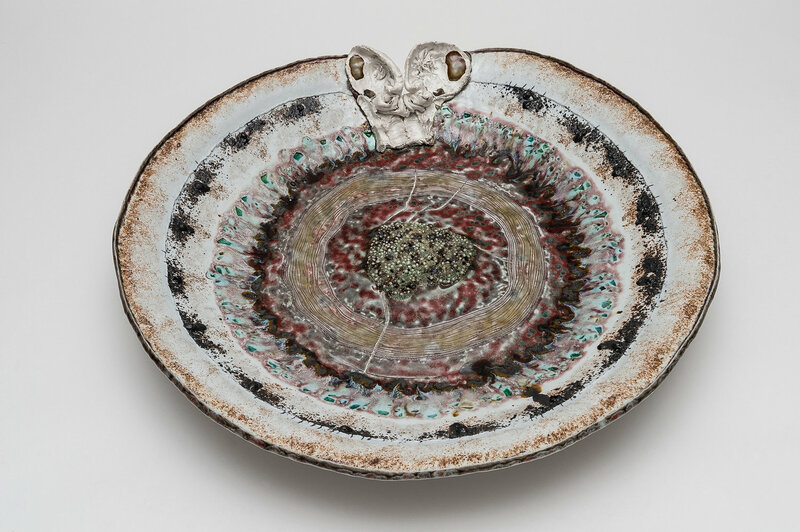 Six works titled “Knot Face” are large platter forms constructed with concentric ropes of soft porcelain, coiled outwards and upwards into a shallow bowl shape. 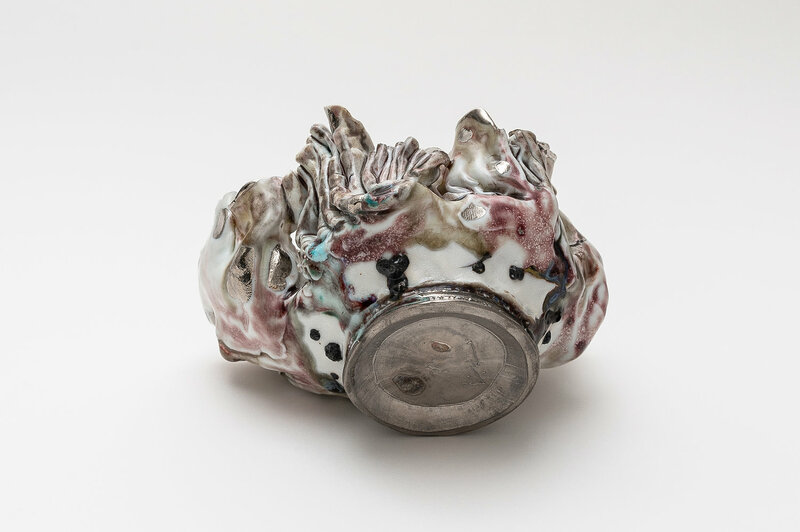 The artwork’s namesake knot detail appears on the rim of each work as a cleft, where the artist ties up the ends of the soft porcelain ropes with side-by-side symmetrical motions of his thumbs and forefingers, resulting in forms which can also be evocative of human body parts. 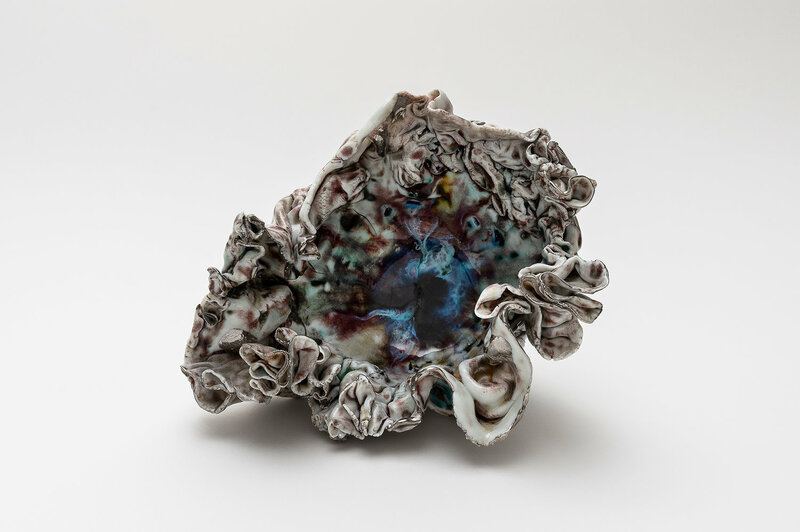 At intervals in the coil building process, the artist presses fragments of broken stained glass into the ropes of porcelain, knowing that when fired in the kiln, gravity will carry colorful stains of melted glass to pool at the edges of the work’s flat central area, which is articulated differently in each work. 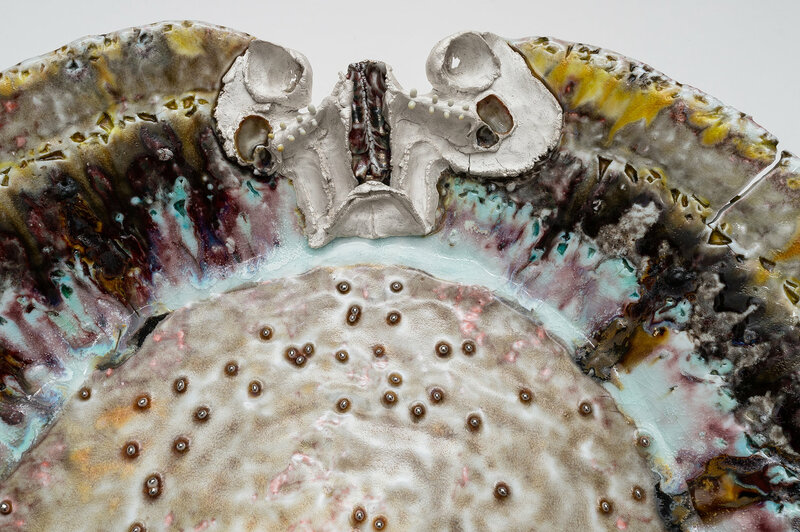 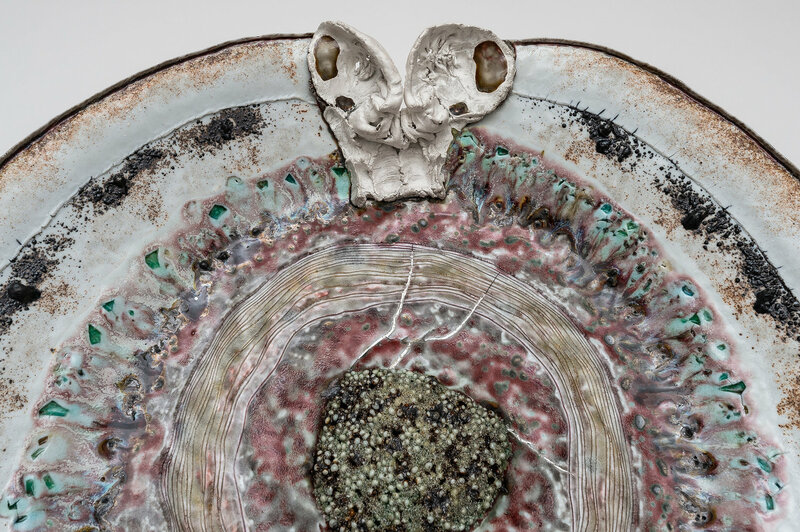 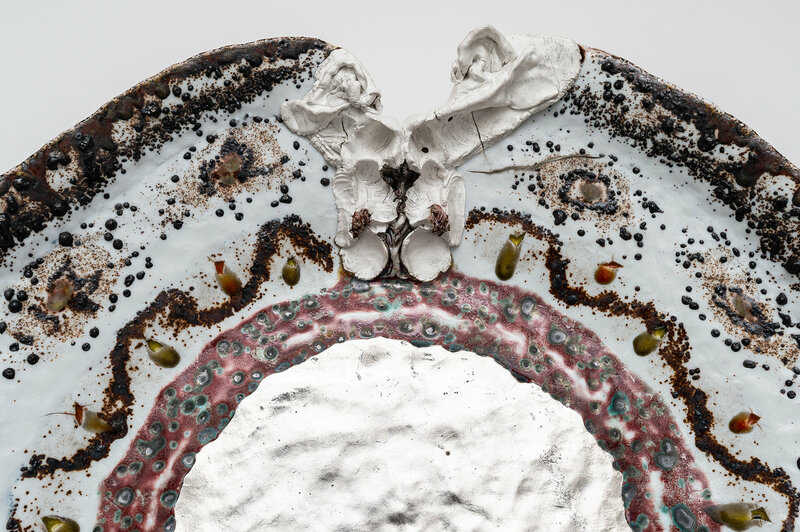 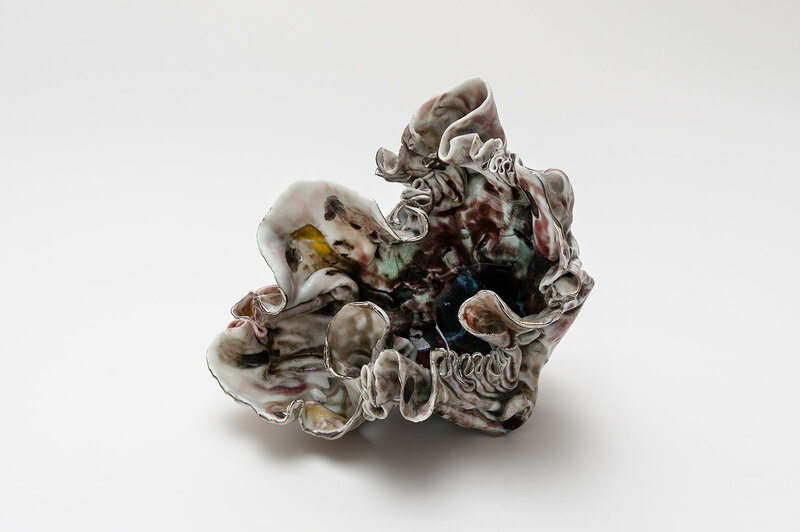 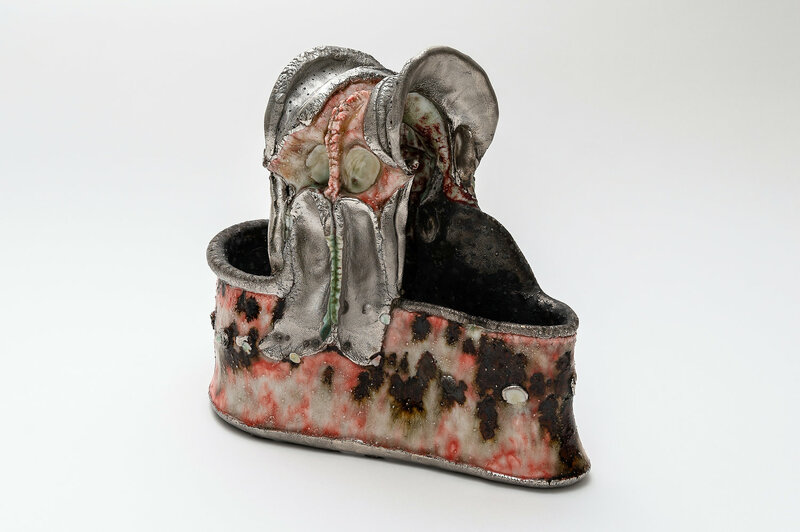 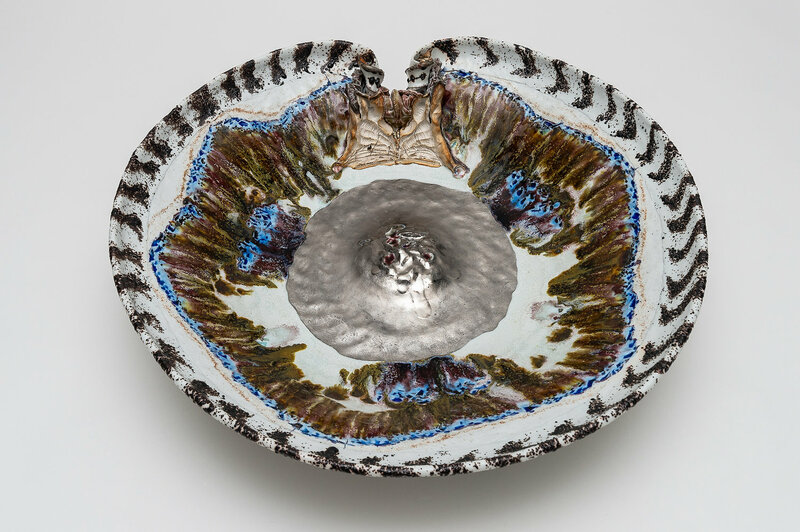 The porcelain is further activated with glazes of color, silver and platinum, scratched details, ocean sand, and slag (a metal-smelting byproduct) which appears as black sprinkles. 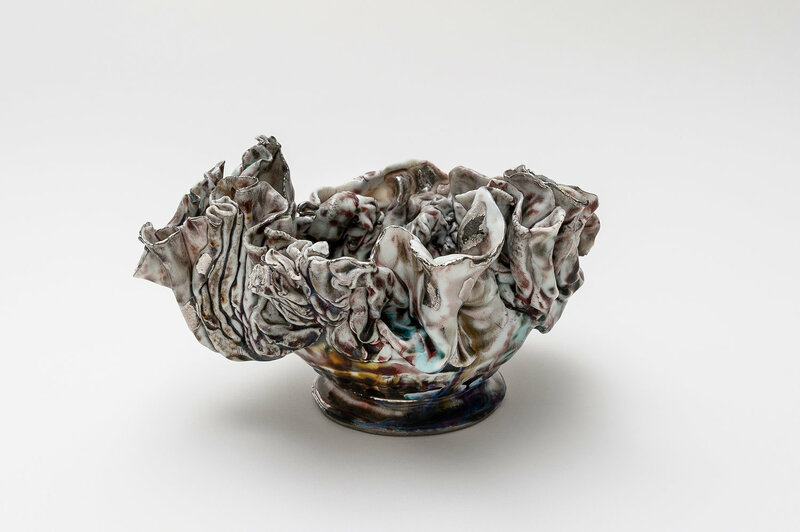 Leaving no surface unarticulated, Kawabata gives equal attention to the underside by carving and scratching intricate patterns into the work’s footing. 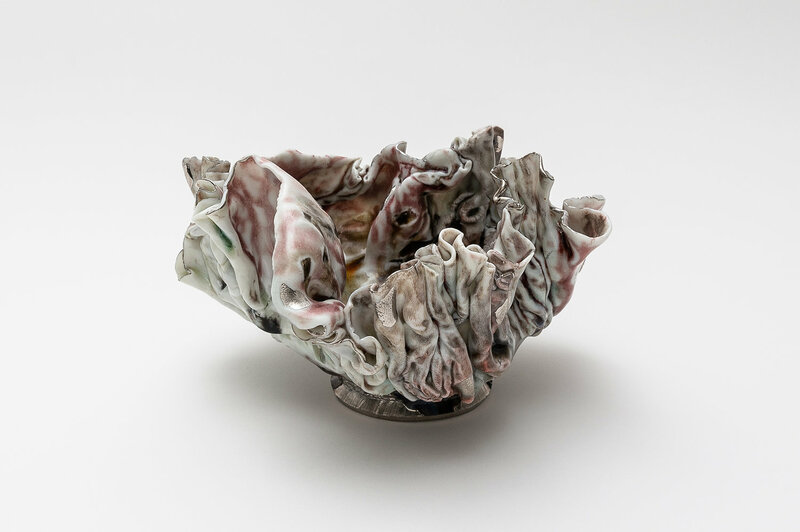 Three bowl formed works titled “Undulating” are named for their extremely fine and meandering rims, formed by a busy thumb and index finger rubbing action which Kawabata did even as a child, without clay. 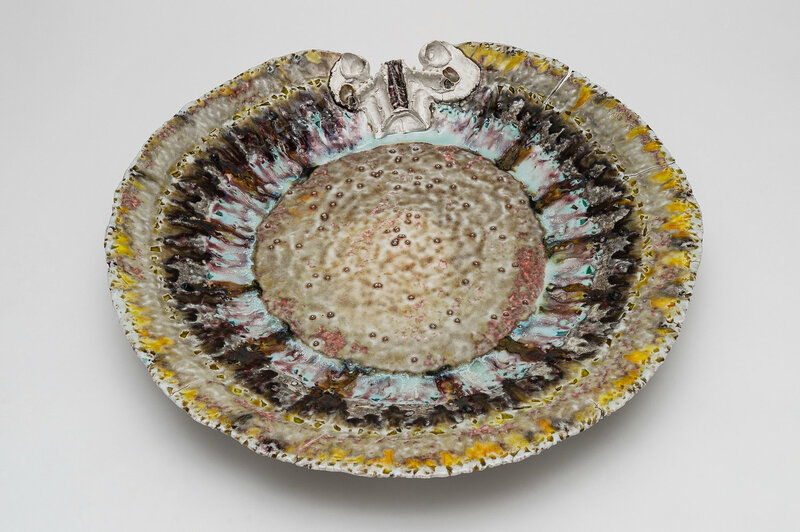 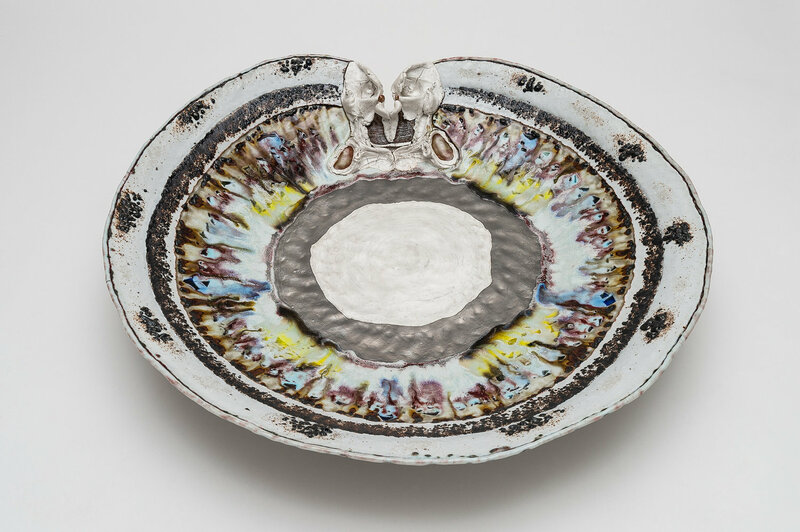 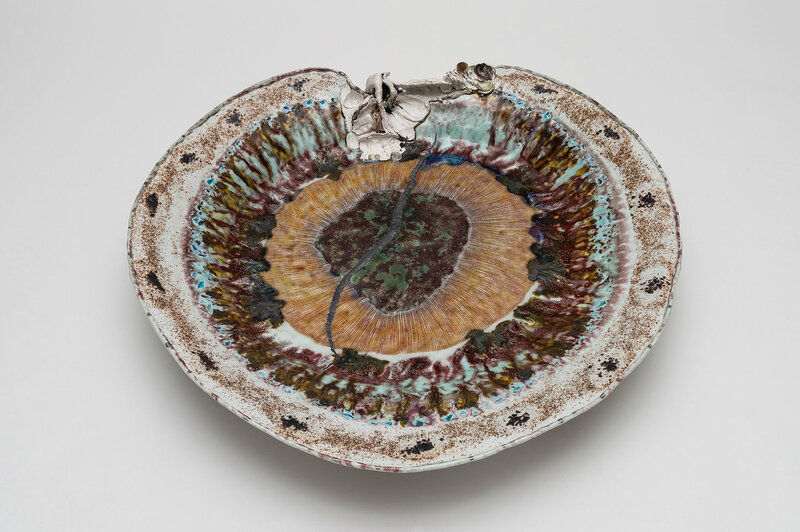 These works achieve their washes of color through the melting of colored glass and gravity, glazes, glints of platinum painted in the body of the bowl and gilding the work’s delicate rim. 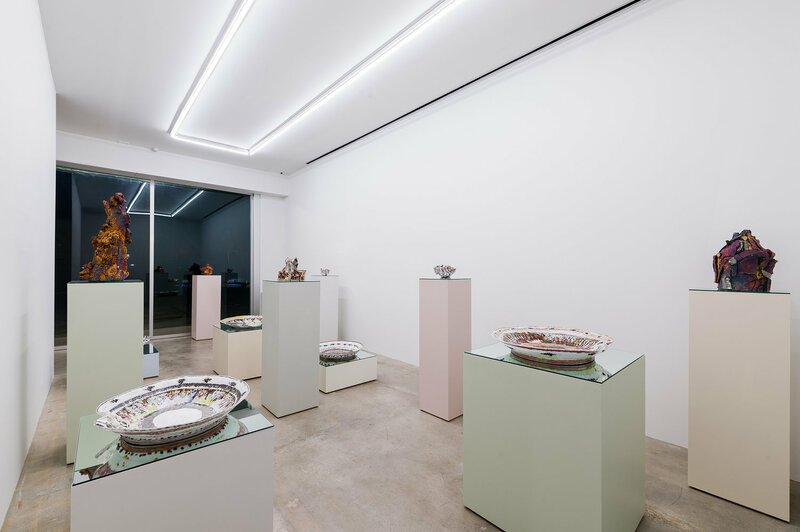 Three work’s called “Soos” derive their name from the Japanese pronunciation of the English word source, as well as from the distress signal S.O.S.. 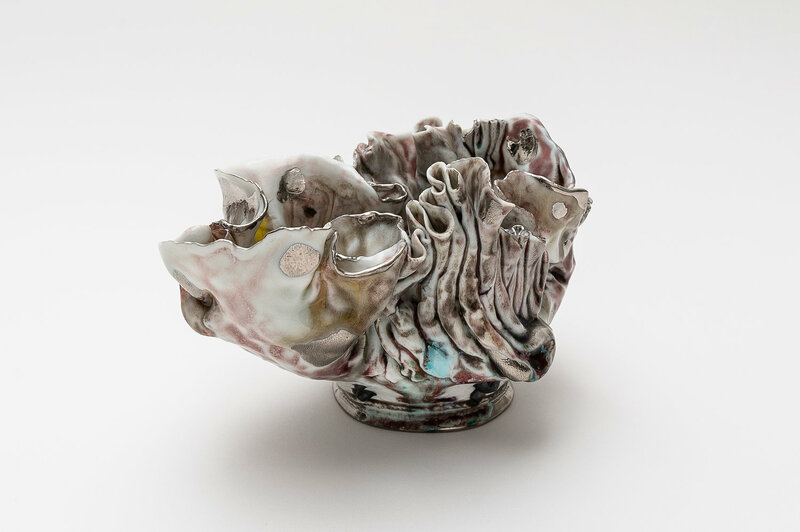 Inspired by nature’s self-regeneration and renewal, Kawabata utilizes the scrap porcelain from other projects to assemble vessel and sculptural forms. 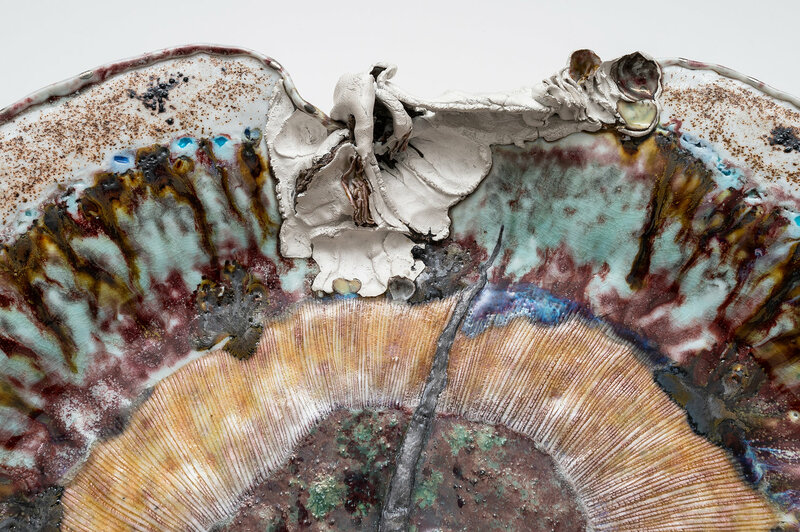 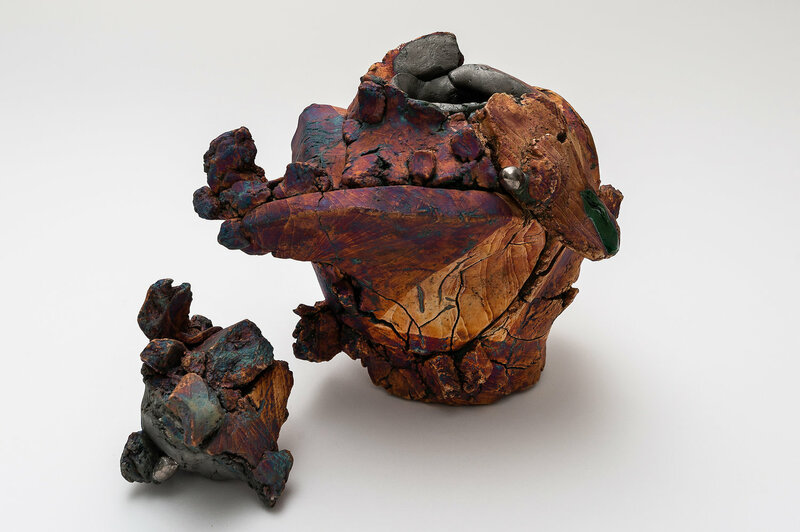 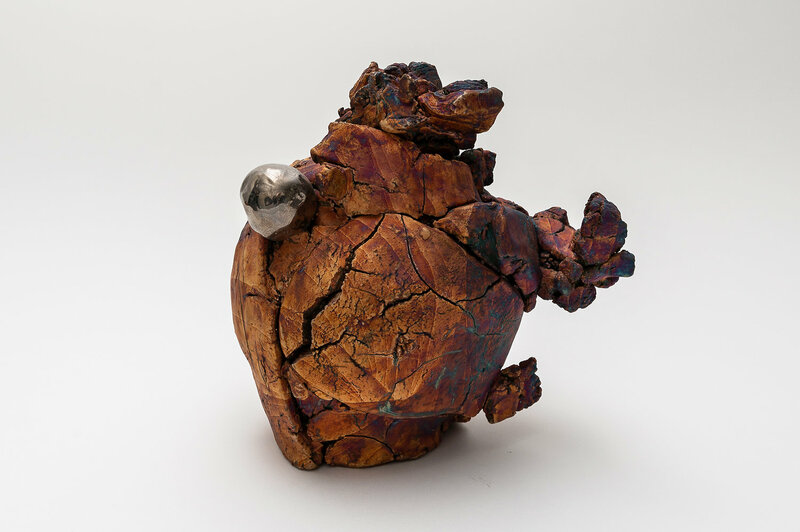 Glazed with silver, the artist takes these works to the onsen (Japanese hot spring) and dips them multiple times into the highly-sulphurized water, creating unique colorful patination and striations in the work’s very matte surface. 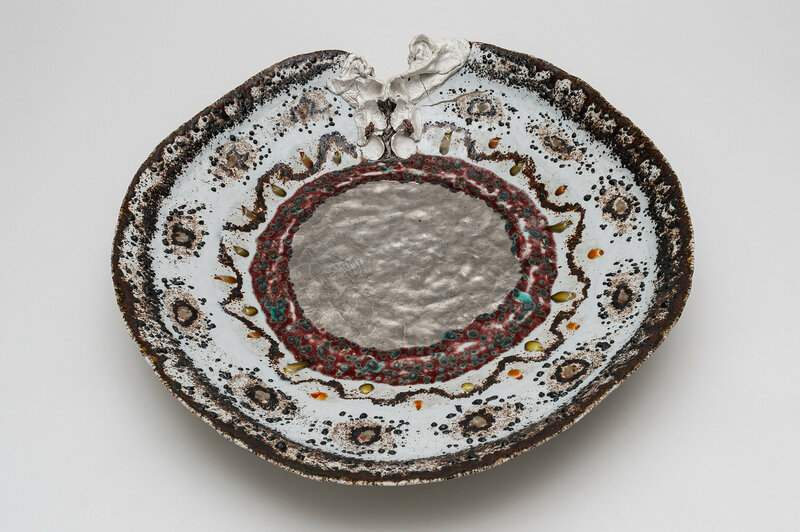 The artist finishes certain details in platinum. 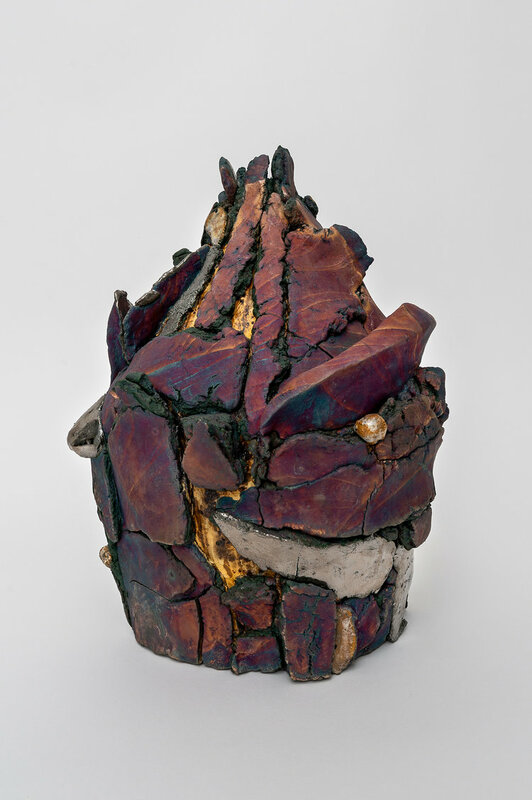 plinth. 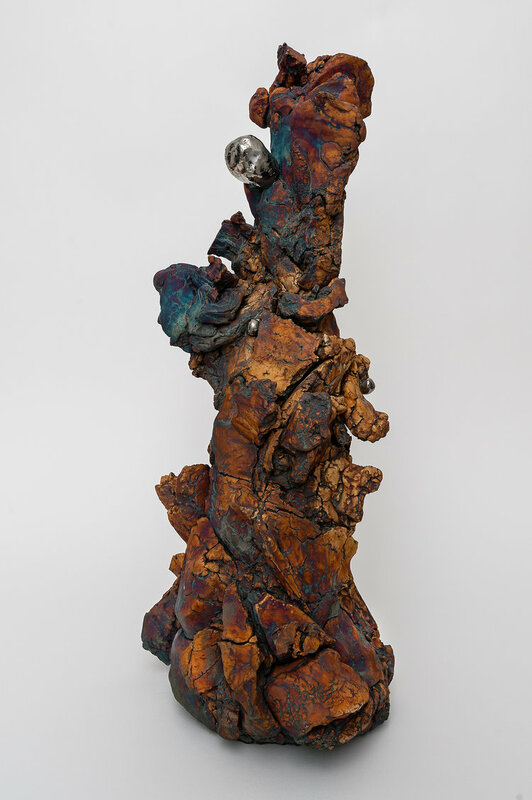 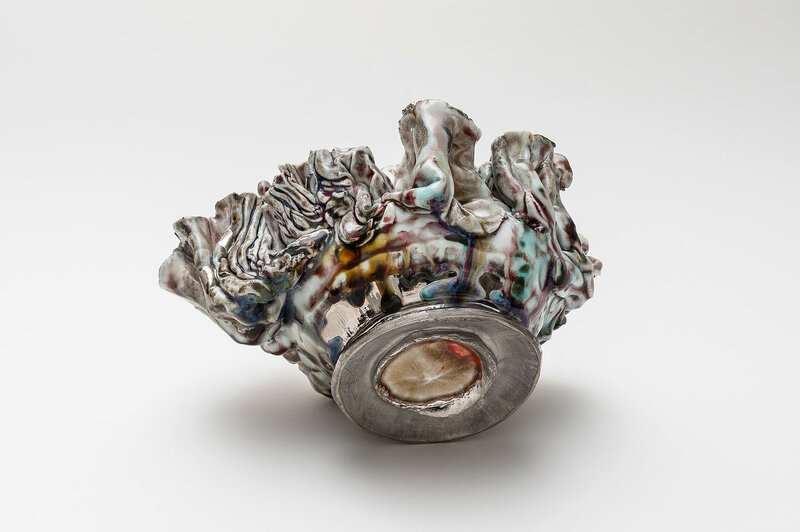 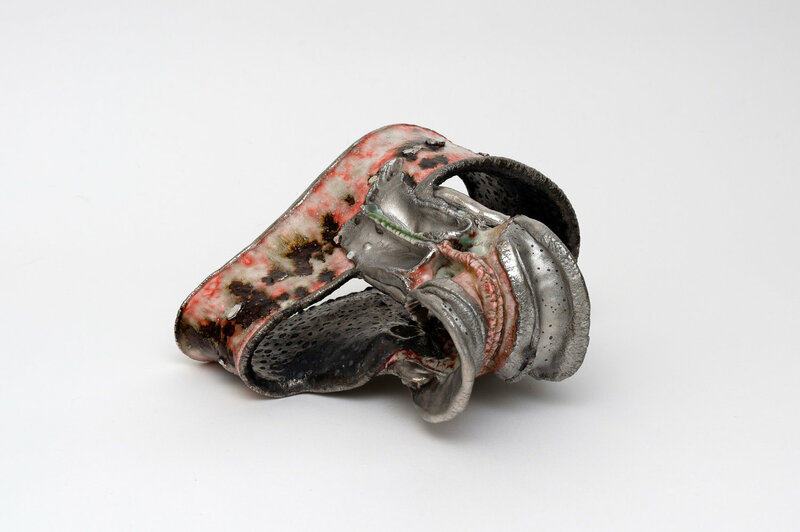 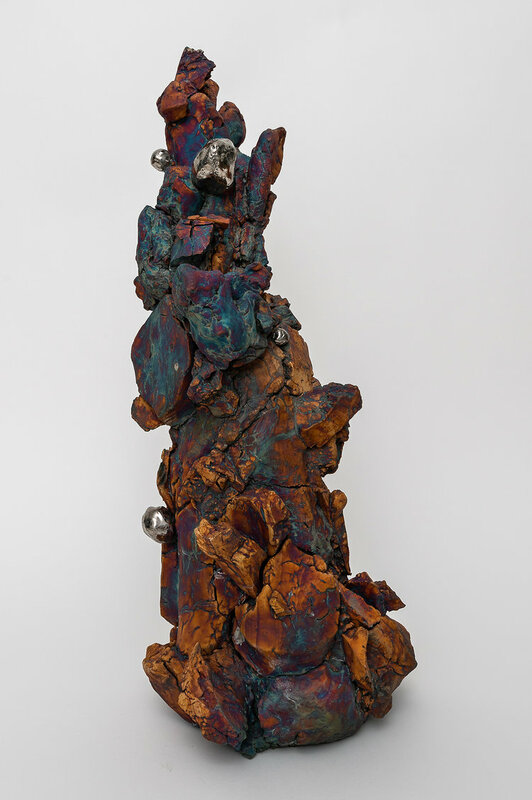 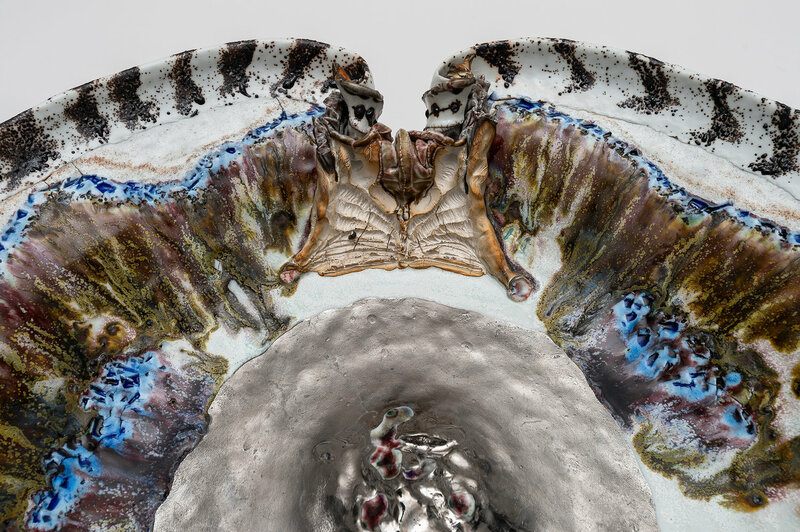 This work, which can be displayed in various orientations, engages Kawabata’s evocative thumb and forefinger handiwork, along with his techniques utilizing broken glass, glazes, silver and platinum (which freckles the work’s seemingly biomorphic interior). 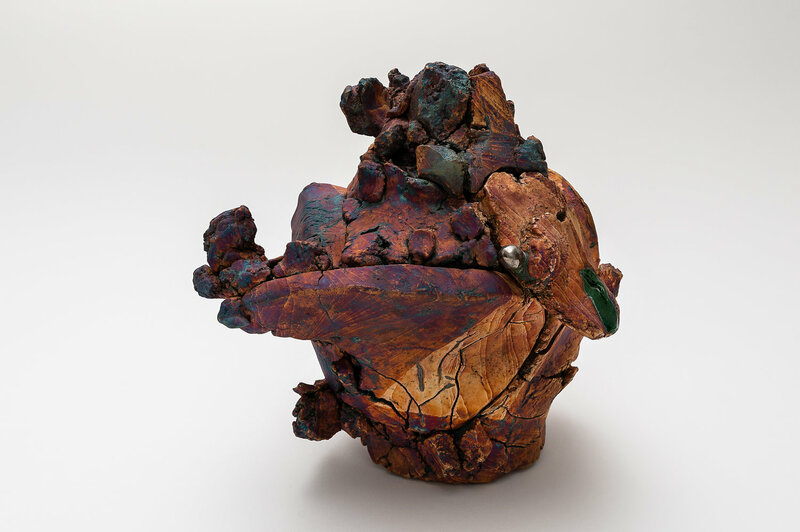 After graduating from the Tajimi City Pottery Design and Technical Center in 2000, Kawabata began winning awards for his work, including the Kamoda Shoji Award at the Mashiko Pottery Exhibition (2004) and the Paramita Museum Ceramic Award (2007). 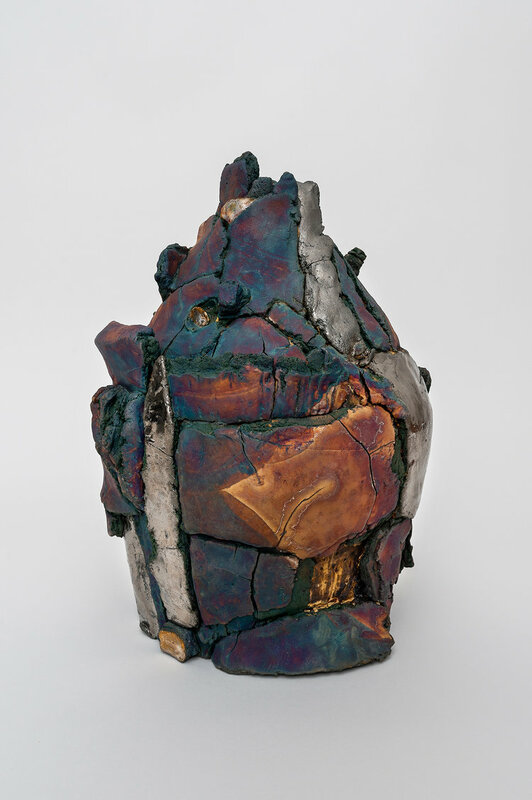 His work has been the subject of numerous solo and grounp exhibitions at highly-reputed ceramic institutions, including the National Museum of Modern Art’s Crafts Gallery (“The Power of Decoration: A Viewpoint on Contemporary Kôgei (Studio Crafts)”, 2009), the Ibaraki Ceramic Art Museum (“Phenomenon of Contemporary Ceramic”, 2014), and the Museum of Modern Ceramic Art, Gifu (2004, 2010). 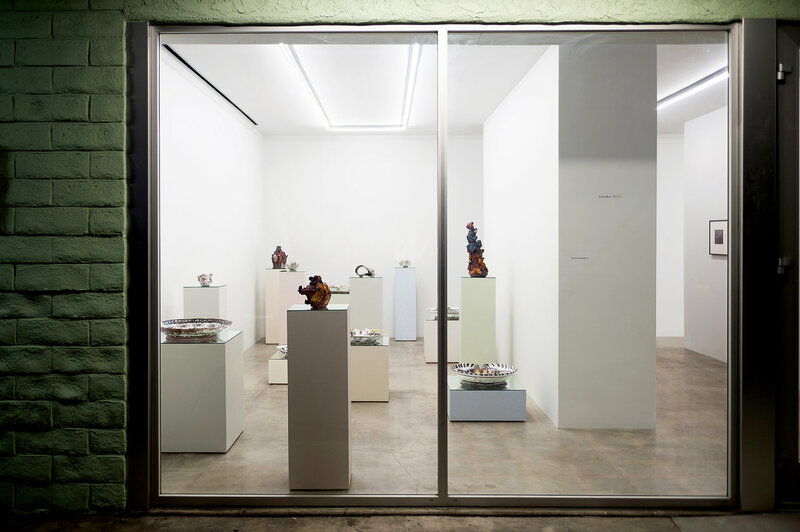 Text/Press release and images provided by the event. 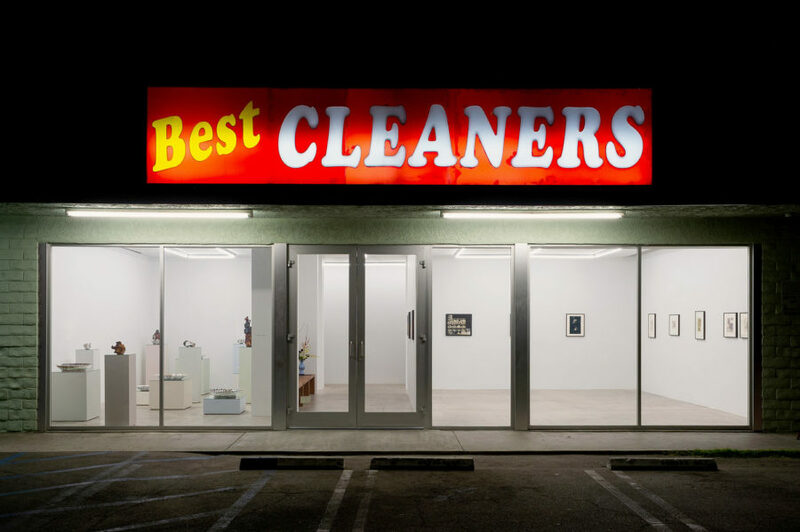 © Kentaro Kawabata, Nonaka-Hill, Los Angeles, CALIFORNIA U.S.A.